Food or fuel? How environmental is biofuel? Home > Food for Mankind > Food or fuel? How environmental is biofuel? At the time of the Arab oil export embargo in the 1970s, importing countries asked themselves if there were alternatives. In the United States, Europe and Brazil, the idea of growing crops to produce fuel for cars was appealing. The modern biofuels industry was launched. This was the beginning of one of the great tragedies of our time. Brazil created a thriving fuel ethanol program based on sugarcane, a tropical plant. Unfortunately for the rest of the world, however, in the United States the feedstock was corn. Between 1980 and 2005, the amount of grain used to produce fuel ethanol in the United States expanded from 1 million to 41 million tons. Between 2005 and 2011, the grain used to produce fuel for cars climbed from 41 million to 127 million tons — nearly a third of the U.S. grain harvest. The United States replacing oil fields with corn fields to meet part of its automotive fuel needs. The appetite for grain to fuel cars is seemingly insatiable. The grain required to fill a 25-gallon fuel tank of a sport utility vehicle with ethanol just once would feed one person for a whole year. The grain turned into ethanol in the United States in 2011 could have fed, at average world consumption levels, some 400 million people. But even if the entire U.S. grain harvest were turned into ethanol, it would only satisfy 18 % of current gasoline demand. The United States quickly overtook Brazil to become the new world leader in biofuels. In 2011, the United States produced 14 billion gallons of ethanol and Brazil under 6 billion gallons; together they accounted for 87% of world output. The 14 billion gallons of U.S. grain-based ethanol met roughly 6% of U.S. gasoline demand. In 1980, the world produced scarcely 1 billion gallons of fuel ethanol. By 2000, the figure was 4.5 billion gallons, increasing to 8.2 billion gallons in 2005, but until 2011 it jumped to 23 billion gallons. Still, worldwide production of biodiesel is less than one fourth that of ethanol. A variety of crops can be used to produce biodiesel. In Europe, where sunflower seed oil, palm oil, and rapeseed oil are leading table oils, rapeseed is used most often for biodiesel, in the United States the soybean is the leading table oil and biodiesel feedstock and elsewhere, palm oil is widely used both for food and to produce biodiesel. In terms of energy efficiency, grain-based ethanol is a clear loser. For sugarcane, the energy yield — that is, the energy embodied in the ethanol — can be up to eight times the energy invested in producing the biofuel. The energy return on energy invested in producing corn-based ethanol is only roughly 1.5 to 1! For biodiesel, oil palm is the most energy-efficient crop, yielding roughly nine times as much energy as is invested in producing biodiesel from it. The energy return for biodiesel produced from soybeans and rapeseed is about 2.5 to 1. An acre of oil palms can produce over 500 gallons of fuel per year — more than six times that produced from soybeans or rapeseed. Growing even the most productive fuel crops, however, still means either diverting land from other crops or clearing more land. The capacity to convert enormous volumes of grain into fuel means that the price of grain is now more closely tied to the price of oil than ever before. 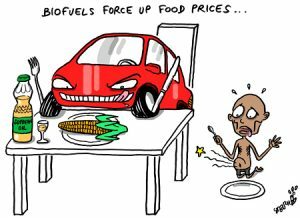 If the price of fuel from grain drops below that from oil, then investment in converting grain into fuel will increase. Thus, if the price of oil reaches, say, $200 a barrel, there would likely be a lot of additional investments in ethanol distilleries to convert grain into fuel. 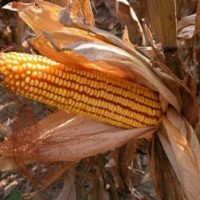 If the price of corn rises high enough, however, distilling grain to produce fuel may no longer be profitable. One of the consequences of integrating the world food and fuel economies is that the owners of the world’s 1 billion motor vehicles are pitted against the world’s poorest people in competition for grain. The winner of this competition will depend heavily on income levels. Whereas the average motorist has an annual income over $30,000, the incomes of the 2 billion poorest people in the world are well under $2,000. Rising food prices can quickly translate into social unrest. When governments subsidize food-based biofuel production, they are in effect spending taxpayers’ money to raise costs at the supermarket checkout counter. Ethanol from cellulose, a better choice? Another possibility is making ethanol from cellulose from corn or sugarcane, the nonedible rests of the plants. Producing ethanol from sugars or starches like corn or sugarcane is a one-step process that converts the feedstock to ethanol. But producing ethanol from cellulosic materials is a two-step process: first the material must be broken down into sugar or starch, and then it is converted into ethanol. Furthermore, cellulosic feedstocks like corn stalks are much bulkier than feedstocks like corn kernels, so transporting them from distant fields to a distillery is much more costly. Removing agricultural residues such as corn stalks or wheat straw from the field to produce ethanol deprives the soil of needed organic matter. It may never become economically viable. The mandate from the European Union (EU) requiring that 10% of its transportation energy come from renewable sources, principally biofuels, by 2020 is similarly ambitious. Among international agribusiness firms, this is seen as a reason to acquire land, mostly in Africa, on which to produce fuel for export to Europe. There is growing opposition to this EU goal from environmental groups, the European Environment Agency, and many other stakeholders. They object to the deforestation and the displacement of the poor that often results from such “land grabbing.” … They are also concerned that, by and large, biofuels do not deliver the promised climate benefits. Beyond this, the use of automotive fuel in the United States, which peaked in 2007, fell 11% by 2012. Young people living in cities are simply not as car-oriented as their parents were. They are not part of the car culture. It now appears that the fleet size will continue to shrink. Within the automobile sector, a major move to plug-in hybrids and all-electric cars will further reduce the use of gasoline. If this shift is accompanied by investment in thousands of wind farms to feed cheap electricity into the grid, then cars could run largely on electricity . The problem is not new. Read what Lester Brown was writing in 2006, compare the numbers and see if you find progress!